The Seedling Laboratory is a room inside of the Haunted Towers in Luigi's Mansion: Dark Moon. 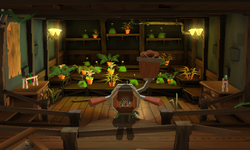 The Seedling Laboratory can be accessed by walking up the stalk inside the Botany Lab or by taking the door on the third floor of the Toolshed Stairs. The Seedling Laboratory is a rather large room. There are several drawers around the area that give money or hearts. In the center of the room is a mechanism that allows Luigi to shoot seeds at the rows of potted plants to the north. There are several pipes and vines running through the area as well as shelves with potted plants. In The Pinwheel Gate, Luigi needs to go to the Seedling Laboratory in order to seek out one of Hiders that took a vane from the Pinwheel Gate. Before Luigi can fight the Hider, he must fight two Greenies. After sucking up the Greenies, Luigi can fight the Hider and get the pinwheel vane after he defeats it. One of the posters here gives out a lot of money when pulled off and destroying all the potted plants with the seed-shooting machine causes four gold spiders to drop from the ceiling. During Graveyard Shift, there are two potted plants in the large plots of dirt. The bottom left plot of dirt has two dandelions, a shovel, and a pitchfork while the top right plot has nothing. Luigi is attacked by three Slammers and a Greenie as well. In Doggone Key, Luigi needs to follow the Polterpup into the Seedling Laboratory after meeting it on the Toolshed Stairs for the second time. The Polterpup's tracks in this room leads Luigi to the Conservatory above. Several red spiders also roam this room. During Hostile Intrusion, the Seedling Laboratory might be one of the rooms infested with ghosts. Starting on The Pinwheel Gate and all missions after, excluding Pool Party, Luigi can use the seed-shooting machine to kill a mouse scurrying along the rows of potted plants. Hitting the mouse causes it to drop the emerald it was dragging along with its tail.